October 28, 1988. 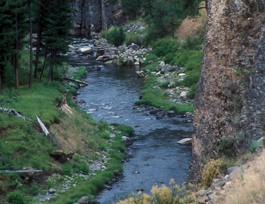 From its headwaters in the North Fork of the John Day Wilderness Area to its confluence with Camas Creek. Wild — 27.8 miles; Scenic — 10.5 miles; Recreational — 15.8 miles; Total — 54.1 miles. From its headwaters in the North Fork John Day Wilderness to Camas Creek, the North Fork of the John Day River is one of the most important rivers in northeast Oregon for the production of anadromous fish. It supports the largest remaining wild run of Chinook salmon and steelhead trout in the Columbia River basin. Wildlife found along the river's corridor includes Rocky mountain elk, mule deer and black bears, along with bald and golden eagles, ospreys and goshawks. The river's diverse landscape and geologic formations create high-quality natural scenery. Man-made developments have a primitive or historic appearance, including early day mining remains. There is a great deal of history from the gold mining era tied to this area. Recreation opportunities range from hiking and horseback riding to rafting/kayaking and gold panning.